We are all filled to the brim with obvious parenting tips and advice. Most of the time the challenge isn’t knowing what to do – but to have the patience and time to do it. With three kids – I have found that what works for one kid, completely backfires with another one! Parenting is not a one size fits all type of situation. I find myself armed with a zillion parenting tools to pull from my tired, desperate tool box to get through the day. Some I favor more than others, but I have been known to completely empty my toolbox – searching desperately for more. With this in mind – I offer you my 5 weirdest, wackiest parenting approaches – that often work in my home. They may not work for you – as each child is different – but more parenting tools can never hurt a desperate toolbox. Let’s get started with the crazy shall we? I am pretty sure this happened by accident, but it started to work. I always have songs in my head. My subconscious is often playing an internal soundtrack throughout the day. It is weird. I know. Anyway, I noticed that my subconscious started to make theme songs for daily activities my children had to do. I started to sing them out loud to my kids. I had a song to wake up the kids, a song when they needed to take a bath, a song when we needed to leave and a song to go to bed. The lyrics and my voice aren’t going to make the billboard charts – but they serve their purpose. What I noticed, is that I didn’t have to nag my kids…as much. They would hear the song and I didn’t have to do my billion warnings. When they were sleeping, playing or dilly dallying around – when they heard me singing – they knew what was coming next. And surprisingly – it made our day smoother. Compliment your kids for behaviors they aren’t doing….what?! Okay – this one is going to sound pretty weird – but I started to do this and I was shocked by how it worked (for my kids anyway). I get that this may not work for everyone. Kids have to be people pleasers and not all children have that disposition. Currently at least, my kids are people pleasers. Whenever they are not listening (not getting out of the bath, getting their clothes on, cleaning up their toys…I think I can go on forever). I just tell my child, “Thank you so much for getting out of the bath!” Or “What great cleaners! Thank you so much!” I usually get a weird look from my kids and then – shockingly – they do it. Not always, but enough for me to go woo-hoo into the toolbox you go! Say okay when they tell you they are NOT going to do something. They normally stare at me with big eyes and then I continue, “I guess I will get back into my pajamas since it looks like we aren’t going out today. I was looking forward to going to the zoo, but oh well.” And then I walk off. 9 times out of 10 – they quickly clean up and try to get me to stop putting my legs into my fuzzy pajamas. When your kids talk disrespectfully – don’t address it – talk for them. This is another bizarre and probably annoying parenting approach I have loved over the years. When my kids demand something with words that don’t sit well with me – I just restate the sentence how I would like it to be said. For instance, when my four year old says, “I want milk!” I say, “Mommy, can I have some milk please.” After some time my kids now just naturally say please and thank you – probably to avoid my annoying banter, but oh well. It works for me. Compliment your child when they say hurtful words to you. And now for my last off the wall parenting tip. When your child says horrible things like, “I hate you” or “I wish I never had you as a parent” – give them the opposite response. Luckily my kids, at least at this stage, don’t say these type of things to me often – but on the rare occasion They do – I respond with “That’s okay. I still love you.” Usually if kids are angry enough to shout these hurtful words, they are looking to hurt you. Reinforcing the behavior by acting like it hurts you doesn’t make much sense to me – so I kill the behavior with kindness. Often it ends up in tears, laughter or both! Do you have a wacky parenting approach that is working for you? Share it with us in the comments below! 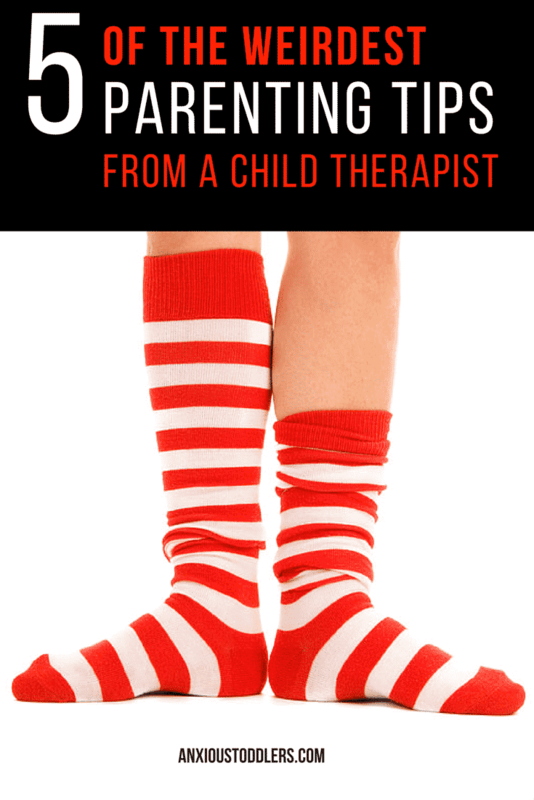 Do you have anxious kids? Natasha Daniels is the author of How to Parent Your Anxious Toddler. She also offers a video course on How to Parent Your Anxious Kids – for all ages.